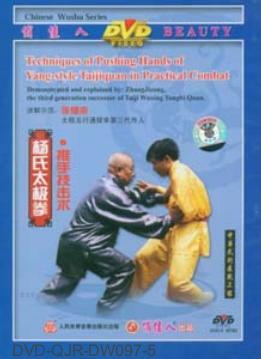 Techniques of pushing hands of Yang-style Taiji Quan in practical combat was directly passed by Yang Jian-hou to "Orient Knight-errant" Zhang Ce who was the creator of Taiji Wuxing Tong Bi Quan. Yang Jian-hou is the third son of Yang Lu-chan who was the founder of Yang-style Taiji Quan. This film embodies the characteristics of Yang-style Taiji Quan, that is move as flying cloud and flowing water, stay at center with comfort, extended unfolding, naturally round and alive, lead to stain and follow to adhere, neither lose nor withstand, neither overdo nor underdo, following the bending to extend. Use the eight techniques of Ward-off, Rub, Press Forward, Push, Pull-down, Pluck, Elbow-strode and Body-stroke, as well as strength route exercise of practicing the feeling response and telergy (ability of strength listening). In this way, you can sense how your opponent changes his force, and master the technipue of "react rapidly if your opponent moves hurryingly, follow slowly if your opponent moves slowly." and "If others don't move, I don't move. If others just want to move, I move first." Influence your opponent's centre of gravity and destroy his strength balance. Look for the right timing to defeat your opponent with only a small power to neutralize a thousand pounds. In this show, it explains the practicing and using of Single Push-Hand, Double Push-Hand, Fixed Stance and Moving Steps Push-Hand in detail. With abundant, widely-covered and valuable content, it is an excellent teaching program.